The Golden Chariot Train trip through the Indian state of Karnataka is not only the most comfortable way to go… it’s the only way. Well that is not exactly true, you could travel through the small villages and farm lands on rutty and unreliable roads, fighting for space with ox-drawn carts, people on bicycles or foot, and unfettered animals lumbering across the road simply to get to the other side. 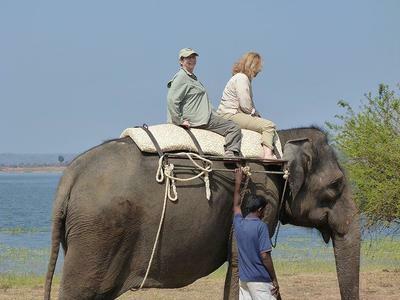 But to make your journey through one of the most exotic and well-preserved historical regions in India less stressful, treat yourself to a cruise-on-land and take the train. Our trip begins in Bangalore - renamed Bengaluru - at the Yeshwantpur Train Station. 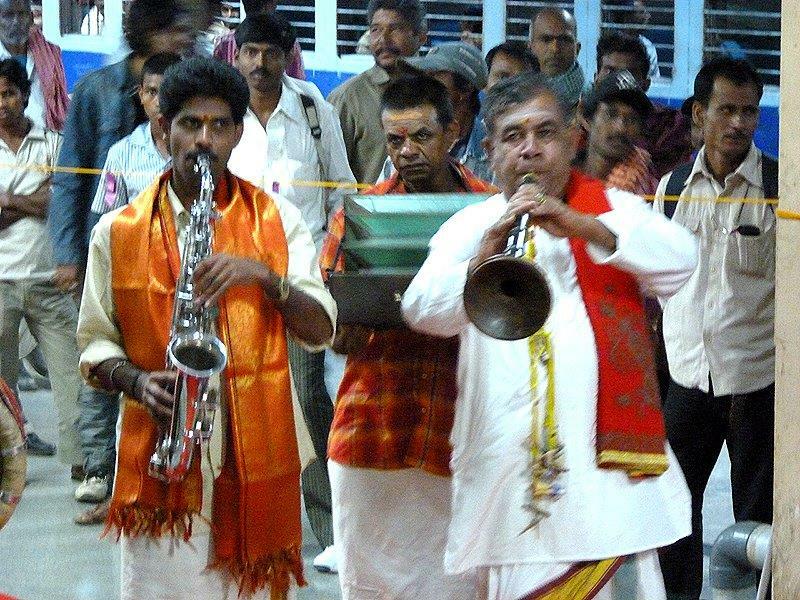 A 4-piece Indian band led us down the platform towards hostesses dressed in colorful saris. 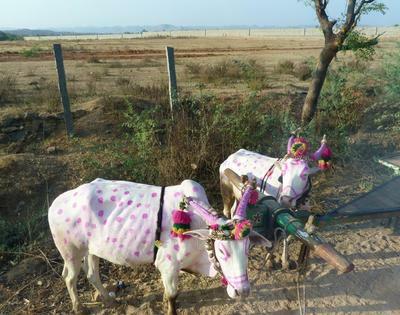 They applied traditional red bindi dots to our foreheads (representing wisdom, love and prosperity) and placed fragrant flower lei around our necks and directed us to walk the red carpet to the purple train. After a welcome aboard party I retired to my cabin and fell asleep to the motion of the wheels chug – chugging over the tracks. In the morning we boarded an air-conditioned bus to take us to our first stop, Bandipur/Kabini and the Rajiv Gandhi National Park, originally the private hunting reserve for the Maharajas of Mysore. A water safari offers a unique opportunity to view the animals as they came out of the thicket to drink and frolic at the waters edge. We saw elephants, monkeys, deer and impala, wild boar and large bison. After lunch we got to ride in a coracle and on an elephant. 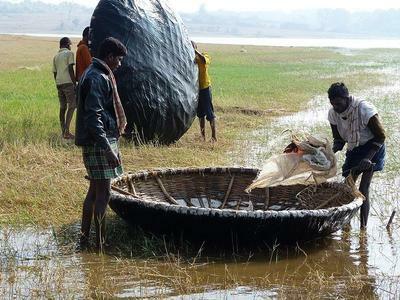 The coracle is a small circular hand-woven boat that is paddled from a kneeling position. The boats often leak so a small stool was placed in the center for me to sit on while I tried my hand at rowing… what a hoot. 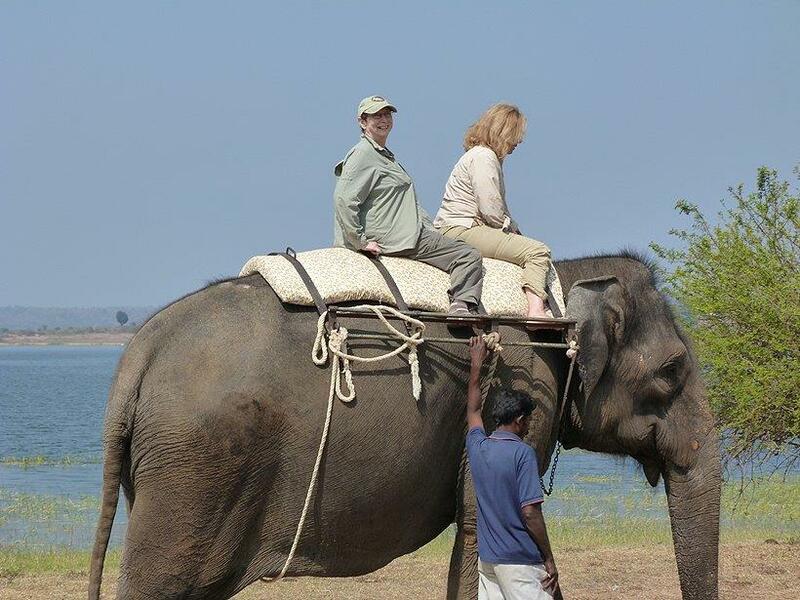 Afterwards we rode on the elephant Meenaskshi, a sweet lady who good naturedly suffered our gleeful attentions. 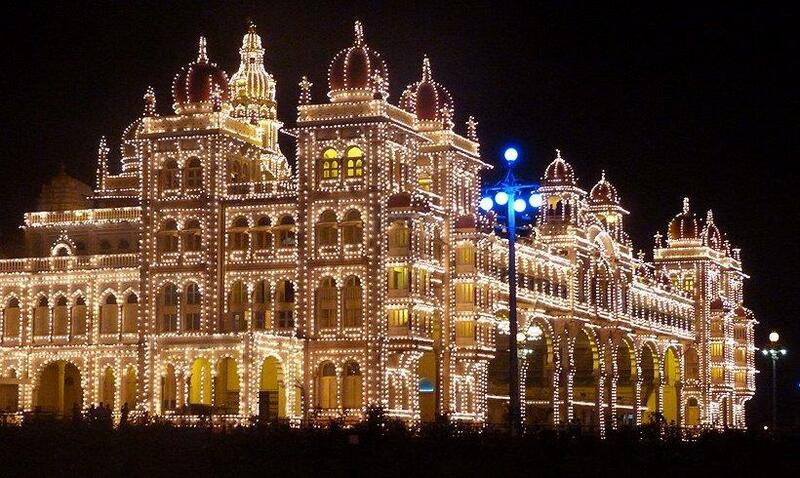 Next day Mysore, and the Museum in the front of the glorious Mysore Palace. On display are treasures of the Wodeyar Kings such as the jewel-studded golden throne which was once hoisted on the back of an elephant to carry the Maharajah past throngs of his adoring subjects. The ex-Maharajah still resides in a corner of the huge edifice. 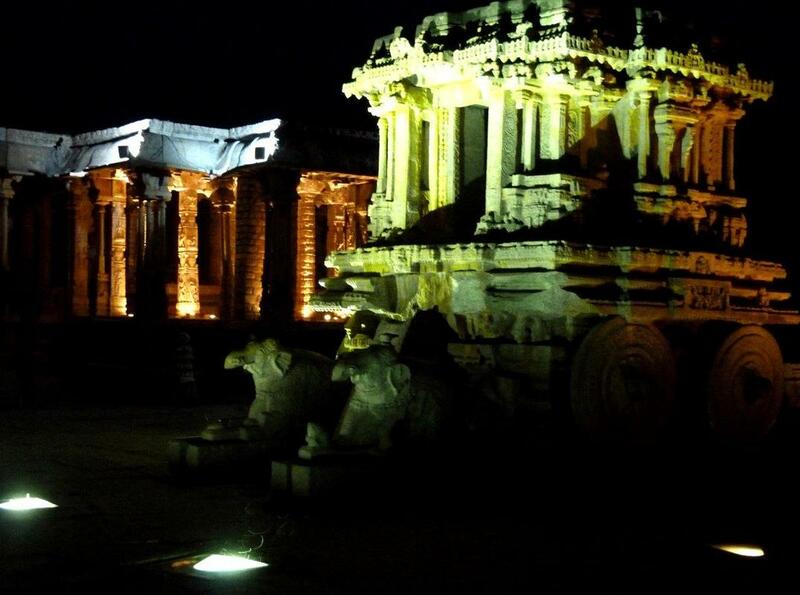 At night the spectacular Palace and grounds are illuminated… a sight to behold. 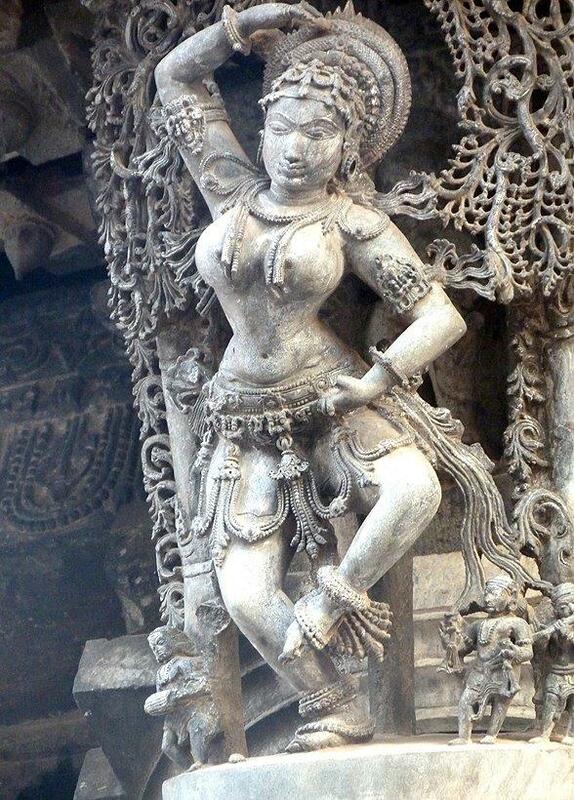 But if Belur and Halebid captivated our imaginations, Hampi was to leave us awestruck. 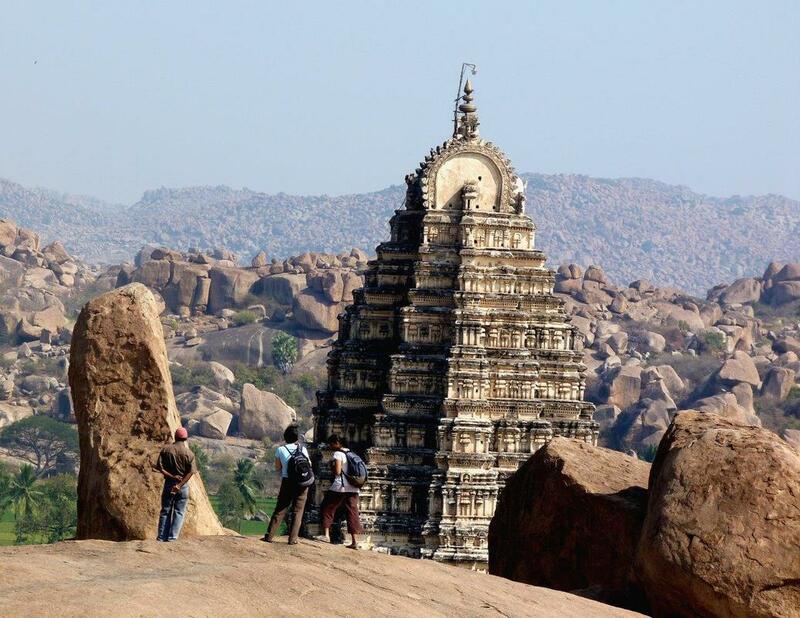 Hampi is classified as a World Heritage Center and major tourist destination and is separated into the Sacred Centre and the Royal Centre. Its buildings were constructed with, around, and sometimes out of, the huge pink granite boulders scattered throughout the hills. The boulders are of such size and shape as to create an otherworldly landscape. 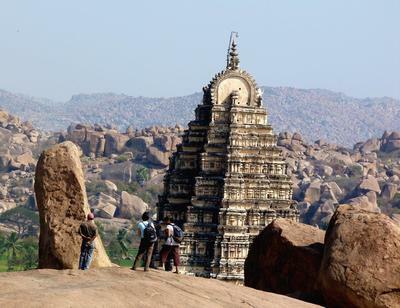 Hidden by the megalithic stones, Virupaksha Temple slowly came into view in the valley below towering over the ancient city. The steep grade down the well-worn rock hill looked far more intimidating than it turned out to be and was thankfully easily navigated. 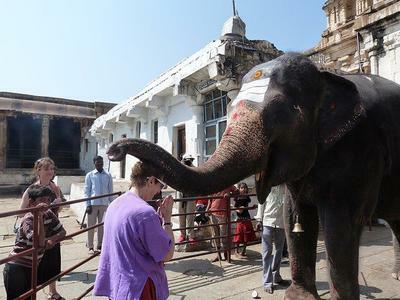 ​Standing by the temple entrance was the “keeper of the gate” a somewhat greedy bestower of blessings; the temple elephant. I watched as children placed a coin in her truck which she quickly passed to her mahout (handler) and then laid her truck on the child’s head in a blessing gesture. When I followed suit, she passed the coin on but refused to bless me… it seems adults are required to pay more of a tribute before being worthy of a blessing. Once I gave an acceptable contribution, I received the blessing… a bop on the head. 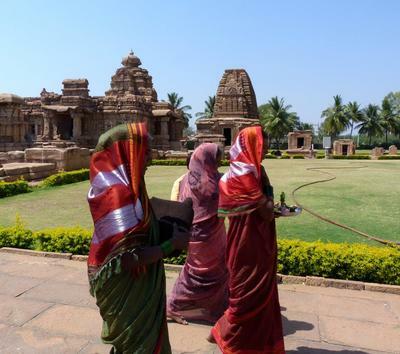 ​​Hampi has clusters of temples all enlivened by temple monkeys that seemed to be everywhere and were adorably photogenic; but for me, the most magical experience was in the Vittala Temple Complex at the Royal Centre. That afternoon, on our way to the temple we drove through Vittala village where preparations were under way for the monthly full moon festival. Cows were painted with pink circles and festooned with brightly colored tassels, hooked up to carts filled with family members dressed in their finery, and on the move to join the ceremonial tower being paraded around town. The scene radiated a joyous air with music, flowers, colorful clothing, and smiling faces all merging in a lively tapestry. Our bus inched its way through the crowds and arrived at dusk in time to see the moon rise between the pillars as a bright orange ball. Once the moon was high in the sky, lights illuminated the ancient carved pillars, competing with the moon for sheer radiance. The King’s Balance is also here. Vertical granite pillars are connected at the top by an adorned horizontal bar from which scales were suspended. The King was weighed against gold, silver, and jewels, and when his weight was “balanced” by the treasure, it was distributed to Brahmins (priestly caste) for the poor. 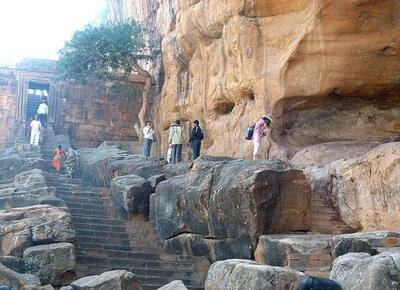 ​Our final temple visits the following day were to the unique 6th century Badami Caves and the Pattadakal Temple Complex. Badami Caves are a sight like no other. Cut into the steep rose-colored sandstone cliffs rising from the Malaprabha River, are a series of four cave temples, each one at a higher elevation than the previous one. The 8th century Pattadakal Ceremonial Temples is a UNESCO World heritage site that has been wonderfully preserved with beautiful landscaped broad green lawns, flower beds, walking paths and gawking tourists.